Adapted by screenwriter Laura Wade from her 2010 play Posh, The Riot Club follows two Oxford freshman, Alistair Ryle played by Sam Claflin, (The Hunger Games: Catching Fire) and Miles Richards played by Max Irons (The Host), who are selected to join the infamous Riot Club, where their membership hinges on the events of a single dinner party. The film is superbly acted even if the cast is a tad too old to be playing college students. Sure, most of these guys are closer to 30 than 20, but Scherfig keeps you too intrigued to care. 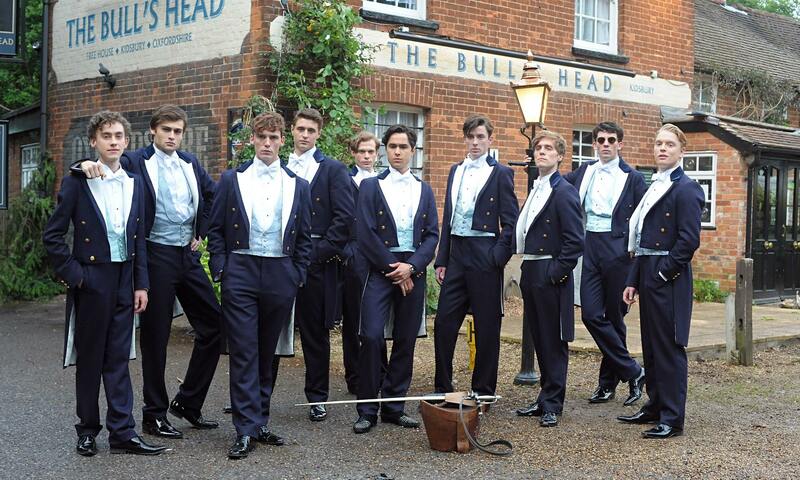 The cast of “The Riot Club.” Photo by IFC Films. Claflin plays Alistair splendidly as an over privileged yuppie who sneers, pouts and schemes. Irons is a perfect foil as Miles, a humble but obtuse guy who was raised in a world of wealth and status. Holliday Grainger (The Borgias) shines as Miles’ girlfriend, a plucky girl from a middle-class family who experiences just how vile the club can be. The film also features small but significant supporting performances from Douglas Booth (Noah), Jessica Brown Findlay (Downton Abbey) and Natalie Dormer (Game of Thrones). The Riot Club gets violently political in a hurry and the characters are so despicable that some scenes are hard to watch. It’s a film that you’ll have a reaction to– but isn’t that the mark of something really great?